Soft spoken southpaw Michael Farenas has scored a smashing 8th round TKO over previously undefeated Mark “Too Sharp” Davis at the Foxwoods Resort in Connecticut Wednesday night (Thursday morning in Manila). Farenas who has devastating power particularly in his left hook worked Davis over and broke him down with power shots to the body head. Farenas staggered Davis in round five and connected with several vicious punches in round six and when the Filipino sent Davis reeling into a corner in round eight referee Steve Smoger stopped the fight. Time was :59. The win in a title eliminator assures Farenas of a crack at the IBF title against the winner of the July 10 rematch between Argenis Mendez of the Dominican Republic and Cuba’s Rances Bartahlemy who fights out of Miami, Florida. Respected boxing writer Steve Kim said the stoppage was a “stay of execution” for Davis. The 30 year old Farenas, the protégé of Penalosa looked good in training and on the eve of the fight Penalosa told the Manila Standard that Farenas “is looking good and ready to rumble” when he battles Davis in an IBF eliminator for the No. 2 junior lightweight spot at the Foxwoods Casino in Connecticut on July 2. Farenas was being handled mainly by Penalosa’s elder brother Carl and strength and conditioning coach Jay San Pedro who studied his regimen in Canada. Penalosa said Farenas was “moving well and is feeling good” even as he added that Farenas is hungry for recognition and a world title shot. With the win Farenas improved to 39—4-4 with 31 knockouts while 27 year old Davis who was ranked No. 11 by the IBF dropped to 18-1 with 5 knockouts. After blowing his chances for a world title bout when he lost to Marlon “Rata” Aguilar of Nicaragua in Mexico on May 8, 2010, Farenas made a remarkable comeback and earned a title shot at WBA champion Takashi Uchiyama on July 7, 2012 but the fight ended in a 3rd round technical draw. 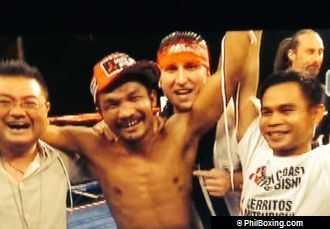 Farenas earned recognition when he was featured on the undercard of the fourth showdown between “Fighter of the Decade” Manny Pacquiao and Mexico’s Juan Manuel Marquez at the MGM Grand Garden Arena on December 8, 2012, in a clash for the WBA Interim title. Gamboa dropped Farenas twice but the courageous Filipino caught the cocky Cuban Olympian with a cracking left hook and dropped him in the 9th round but eventually lost a twelve round unanimous decision. Farenas hammered overmatched Mexican Gerardo Zayas, dropping him three times in the opening round to win by a TKO in Austin, Texas on April 27, 2013 and in his last fight scored a 2nd round TKO over Mexican veteran Hector Velazquez to win the vacant WBC Asia Boxing Council Continental title. Velazquez had previously lost by a 6th round TKO in a WBC International super featherweight title bout to “Fighter of the Decade” Manny Pacquiao on September 10, 2005. Davis was an outstanding amateur who won a gold medal at the US Junior Olympics in 2002 and several other gold medals before winning at the Eastern Olympic trials for the 2008 Olympic Games. In his last fight Davis won a ten round unanimous decision over Carlos Vinan of Ecuador. Farenas didn’t tajke any chances and went after Davis winning the first four rounds handily before taking a breather in the nfifth round and then coming on strong to overpower Davis. Farenas will now face the winner of the face-off between champion Argenis Mendez (21-2-1, 11 KO’s) of the Dominican Republic and former Cuban Olympian, undefeated Rances Barthelemy (19-0, 12 KO’s)at the Convention Center in Miami, Florida on July 10.